Posted on 08/15/2018 by Dr. Patrick Young wrote in Gallery. It has 0 Comment. 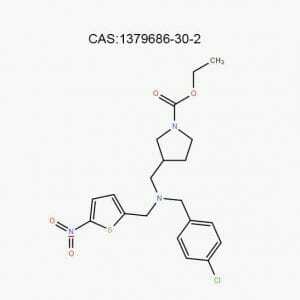 JW-642 (1416133-89-5) is a potent, selective monoacylglycerol lipase (MAGL) inhibitor with IC50 of 7.6, 14 and 3.7 nM for mouse, rat and human MAGL, respectively. Endocannabinoids such as 2-arachidonoyl glycerol (2-AG) and arachidonoyl ethanolamide are biologically active lipids that are involved in a number of synaptic processes including activation of cannabinoid receptors. Monoacylglycerol lipase (MAGL) is a serine hydrolase responsible for the hydrolysis of 2-AG to arachidonic acid and glycerol, thus terminating its biological function. 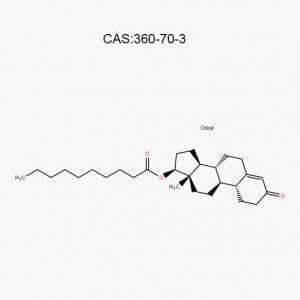 JW-642 is a potent inhibitor of monoacylglycerol lipase (MAGL) that displays IC50 values of 7.6, 14, and 3.7 nM for inhibition of MAGL in mouse, rat, and human brain membranes, respectively.1 JW-642 is selective for MAGL, requiring much higher concentrations to effectively inhibit fatty acid amide hydrolase activity (IC50s = 31, 14, and 20.6 µM for mouse, rat, and human brain membranes, respectively). 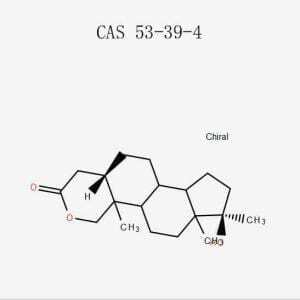 Target: MAGL inhibitor JW-642 is selective for MAGL, requiring much higher concentrations to effectively inhibit fatty acid amide hydrolase activity (IC50s = 31, 14, and 20.6 M for mouse, rat, and human brain membranes, respectively). 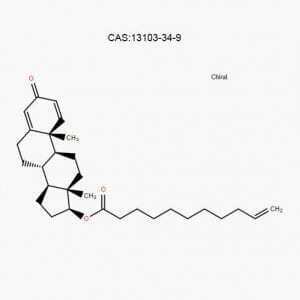 OL-135 is a CNS penetrant, highly potent and selective reversible inhibitor of FAAH. OL-135 exhibits analgesic pharmacology in various animal models without the motor impairment associated with direct CB1 agonism.FAAH Inhibitor OL-135 disrupts the acquisition, but not consolidation, of contextual fear conditioning.Auditory fear conditioning and shock reactivity remain unaffected.Together, these data suggest a specific role for endocannabinoids in a subset of fear conditioning paradigms. Shipping Condition Shipped under ambient temperature as non-hazardous chemical. This product is stable enough for a few weeks during ordinary shipping and time spent in Customs. Storage Condition Dry, dark and at 0 – 4 C for short term (days to weeks) or -20 C for long term (months to years). 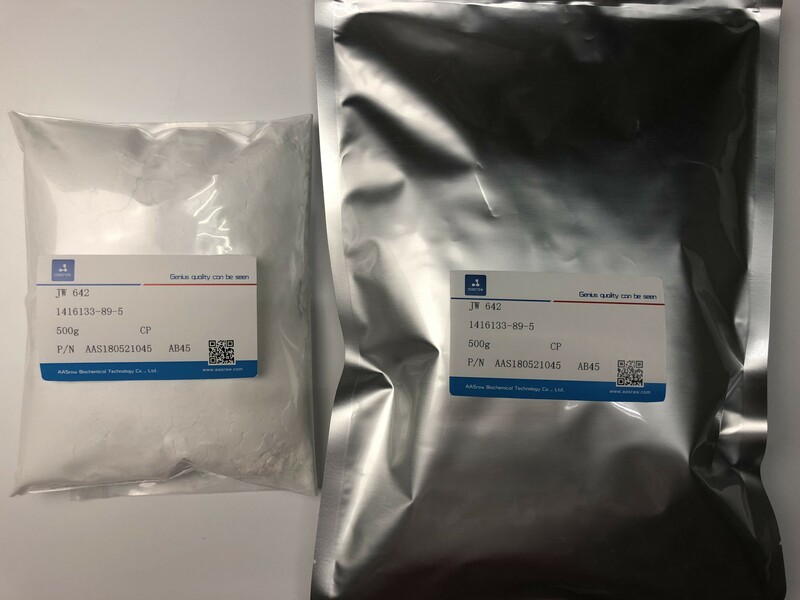 OL-135 is a CNS penetrant, highly potent and selective reversible inhibitor of FAAH devoid of CB1, CB2 and μ and δ opioid receptors activities that increases the analgesic and hypothermic activity of anandamide. Fatty acid amide hydrolase (FAAH) is the enzyme responsible for hydrolysis and inactivation of fatty acid amides including anandamide and oleamide. PF-750 is a potent, time-dependent, irreversible FAAH inhibitor with IC50 values of 0.6 and 0.016 µM when preincubated with recombinant human FAAH for 5 and 60 minutes, respectively.1 Activity-based profiling of various human and murine tissue proteome samples revealed that PF-750 is highly selective for FAAH relative to other serine hydrolases, showing no discernable off-site activity up to 500 µM. PF-750 is a potent, time-dependent, irreversible FAAH inhibitor with IC50 values 0.6 and 0.016 μM when preincubated with recombinant human FAAH for 5 and 60 minutes, respectively. Fatty acid amide hydrolase (FAAH) is the enzyme responsible for hydrolysis and inactivation of fatty acid amides including anandamide and oleamide. Activity-based profiling of various human and murine tissue proteome samples revealed that PF-750 is highly selective for FAAH relative to other serine hydrolases, showing no discernable off-site activity up to 500 μM. PF-750 shows 10-fold better potency than URB597 (Sigma# U4133) after 30 min preincubation. PF-750 is highly selective on FAAH. Even at as high as 500 μM, it had no interactions with many tested enzymes, but URB597 and other known FAAH inhibitors did not perform well at low concentraction (100 μM). JZL-184(1101854-58-3) is a potent and selective inhibitor of MAGL with IC50 of 8 nM and 4 μM for inhibition of MAGL and FAAH in mouse brain membranes respectively. IC50 value: 8 nM Target: MAGL inhibitor in vitro: JZL-184 prolongs DSE in Purkinje neurons in cerebellar slices and DSI in CA1 pyramidal neurons in hippocampal slices. JZL-184 is more potent in inhibiting mouse MAGL than rat MAGL. in vivo: When administered to mice at 16 mg/kg, intraperitoneally, JZL-184 reduces MAGL activity by 85%, elevates brain 2-AG levels by 8-fold, and elicits analgesic activity in a variety of pain assays that qualitatively mimics direct central cannabinoid (CB1) agonists. Acute administration of JZL-184 to FAAH(-/-) mice enhanced the magnitude of a subset of cannabimimetic responses, repeated JZL-184 treatment led to tolerance to its antinociceptive effects, cross-tolerance to the pharmacological effects of Δ-tetrahydrocannabinol, decreases in CB1 receptor agonist-stimulated guanosine 5′-O-(3-[(35)S]thio)triphosphate binding, and dependence as indicated by rimonabant-precipitated withdrawal behaviors, regardless of genotype. JZL-184 selectively inhibits MAGL, the enzyme predominantly responsible for the degradation of the endocannabinoid 2-arachidonoylglycerol (2-AG). Anandamide and 2-AG are the two endogenous endocannabinoids that activate the cannabinoid receptors CB1 and CB2. Anandamide is predominantly metabolized by fatty acid amide hydrolase (FAAH), whereas monoacylglycerol lipase (MAGL) is thought to be the enzyme primarily responsible for the degradation of 2-AG. It is difficult to separate the activities of the two because most currently available inhibitors of MAGL are not selective, and also inhibit FAAH or other enzymes. JZL-184 is the first selective inhibitor of MAGL with nanomolar portency and over 200-fold selectivity for MAGL vs FAAH. 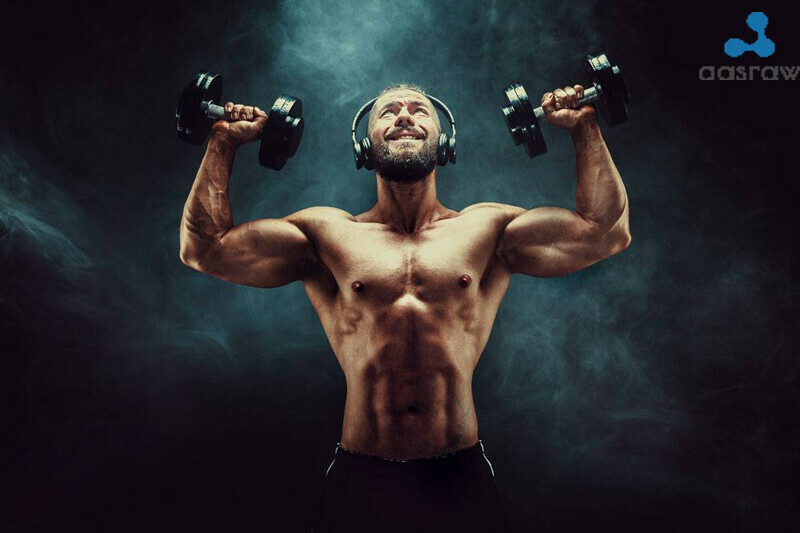 When administered to mice, JZL-184 increased levels of 2-arachidonoylglycerol in the brain by about 8-fold, with no effect on levels of anandamide. The endocannabinoids 2-arachidonoyl glycerol (2-AG) and N-arachidonoyl ethanolamine (anandamide) are principally degraded by monoacylglycerol lipase (MAGL) and fatty acid amide hydrolase (FAAH), respectively. 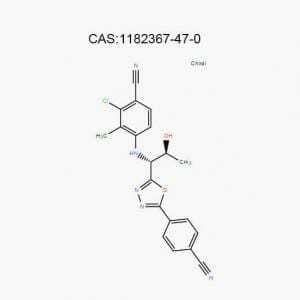 The recent discovery of O-aryl carbamates such as JZL-184 as selective MAGL inhibitors has enabled functional investigation of 2-AG signaling pathways in vivo. Nonetheless, JZL-184 and other reported MAGL inhibitors still display low-level cross-reactivity with FAAH and peripheral carboxylesterases, which can complicate their use in certain biological studies. Here, we report a distinct class of O-hexafluoroisopropyl (HFIP) carbamates that inhibits MAGL in vitro and in vivo with excellent potency and greatly improved selectivity, including showing no detectable cross-reactivity with FAAH. These findings designate HFIP carbamates as a versatile chemotype for inhibiting MAGL and should encourage the pursuit of other serine hydrolase inhibitors that bear reactive groups resembling the structures of natural substrates. ♦ Google AASraw, enter into www.aasraw.com. ♦ Find out JW-642 Powder windows XP, and write down your requirmnets. ♦ We get your email and talk more details with you. ♦ Confirm the order, then payment done and we will arrange delivery goods for you later.